The Tapulanga Foundation is looking for a donor/s to sponsor Donna Grace Duremdes. She would like to start Kindergarten in SFAS in June 2010. I am Donna Grace Duremdes. You can call me Inday. I was born in February 15, 2005. I live in Hacienda Lonoy, Silay City. My father is Leo and he works as a laborer in a sugarcane farm earning Php1300 or $30 a week. My mother is Lorna and she stays home. I have 2 brothers. Leonard is a Prep student and scholar in St. Francis of Assisi School. Mark is only 1 year old. My favorite food is fruit salad. I sweep the floor at our house. 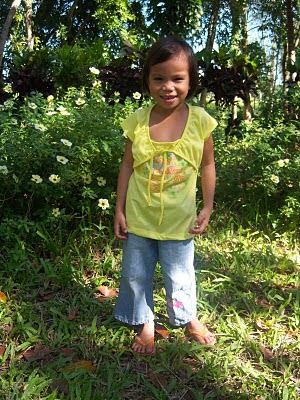 It costs Php7000 or $160 a year to send Inday to school.